VTech is making easier for any home to have an advanced security system. They have launched the world’s first home phone with security monitoring integrated, in Australia. 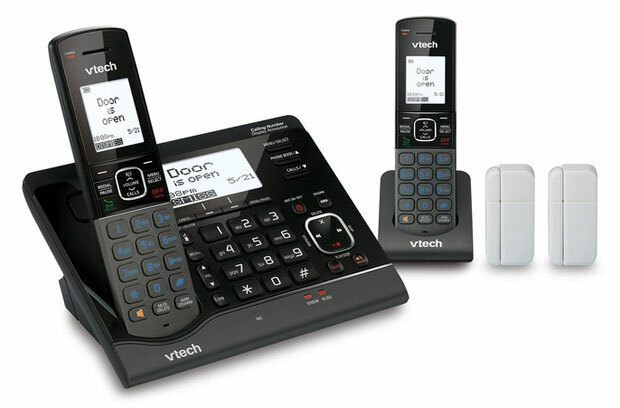 The VTech VS150 works as a base station to a number of sensors located around the home, if triggered the phone will call the homeowner or any designated number to alert them of the incident. The VTech VS150 will notifies you when the device runs low on battery power. It uses contact sensors that are Ultra Low Energy (ULE) devices running on non-rechargeable batteries. The VSmart Wire-Free sensor system is easy to install and no expensive wiring is required. Once activated, the sensors provide tailored internal alarms to the base of the phone and the handset. The phone can call up three external numbers to notify the owner or send alerts to their mobile phone. The handset also includes hands-free speakerphone, a digital answering machine and call guard that helps block unwanted calls. The VS150 twin DECT6.0 cordless phone comes packed with two contact sensors that notify the user if anything is open or closed in their absence. Additionally, a motion sensor and garage door sensor are available for purchase separately.The VTech VS150 cost AU$249.